Warren’s Taylor Childress drives against Harbor Creek’s Jenna Babay. 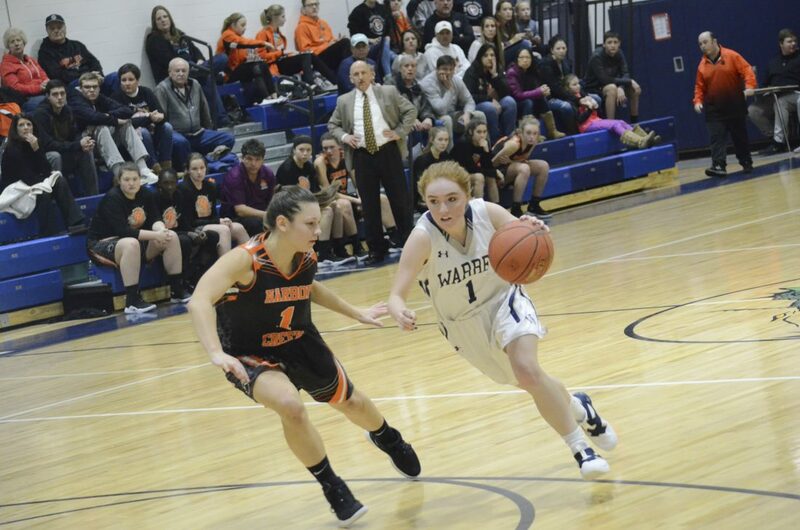 HARBORCREEK, Pa. – The Warren Lady Dragons were sky-high following Monday night’s upset of Villa Maria, and they went to Harbor Creek Thursday with a chance to clinch a share of the Region 6 title. Playing in front of a raucus crowd on Senior Night, the Huskies made sure the Dragons wouldn’t get that title. Behind a game-high 34 points from Ali Benim, Harbor Creek came away with a thrilling 70-62, triple overtime win over Warren. The Huskies (15-5 overall, 5-4 Region 6) jumped out to a 19-13 lead after the first eight minutes. Warren (17-2, 7-2) was able to cut into the deficit in the second quarter and trailed 28-24 at halftime. Hot shooting and a new defensive scheme helped Harbor Creek build the first half lead. The Huskies pushed the lead to five heading into the final frame, but the Dragons fought back and tied it up to send the game to overtime. Neither team was able to do much offensively in the first overtime and combined to score just four points. Warren had a chance to put the game away with under a second left, but Taylor Childress came up empty on the free throw line and the game moved to a second overtime. The second extra period played out much like the first, with neither team able to score more than two points. Warren had another opportunity late after a steal, but couldn’t get the shot to fall. The Huskies fed off the energy from the home crowd and surviving the late scares and outscored the Dragons 8-0 in the third overtime to get the win. The Huskies also got double digit scoring from Latisha Baker with 14 points, but the Dragons held Harbor Creek’s second-leading scorer, Jenna Babay, to just five points. Through two full games and four overtime periods, Babay has just 16 total points in the season series. “I felt like we executed parts of the game plan, but not all of it,” LaVan said. Newly minted all-time Dragons scoring leader, Margo Loutzenhiser, led the way offensively with 27 points. Emma Ruhlman and Riley Childress each had 11 points and Alanna Hultberg added nine. Riley Childress had four steals and Hultberg grabbed seven rebounds. Despite missing out on clinching a share of the region title, LaVan is happy with the way the end of the regular season is shaping up. The Dragons have another tough road challenge ahead Saturday when they travel to Mercyhurst Prep. The Lakers are 15-5 on the year and sit atop the Region 3 standings with a perfect 13-0 region record. It will be a matinee tip-off with junior varsity set to begin at 3 p.m. and varsity at 4:30 p.m.
Harbor Creek won the junior varsity game, 41-36. Katie Madigan led the Dragons with 15 points and Teagan Paris had nine. 3-point FGs: Warren (5)-R. Childress 3, Ruhlman, Loutzenhiser. Harbor Creek (4)-Benim 4.